Vocal Problems With Your Voice Cracking? Vocal problems with voice cracking? Learn how to overcome this common singing problem. Do you struggle with your voice “cracking” or “breaking”? I can help you fix this problem! This cracking that you are hearing is happening because you are not smoothly moving through your vocal registers. You see, there are three main registers you can sing in. For the lower notes you sing in your chest voice. And the higher notes are sung either in your mixed voice or your head voice. And here’s the thing. There are “transition points” in your voice where you switch between these registers. 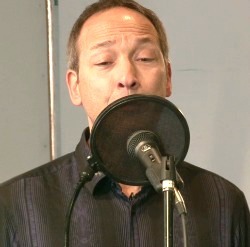 For example, when you reach the top of your chest voice, you need to make the appropriate adjustments to move smoothly into your mixed voice. If you don’t do this properly, your voice will make a cracking sound, and everything will fall apart. These *switching points* have a technical term. They are called your “vocal bridges”. So how do you fix this vocal problem of your voice cracking? You need to learn to navigate your vocal bridges! Well, there are some special exercises that glue your vocal registers together like magic. When you practice these exercises you can move through your vocal registers smoothly with no cracking or breaking. In fact, with this vocal training, it will feel like you don’t actually have three separate vocal registers anymore. Your voice will feel like “one instrument”. You will be able to sing from your lowest note to your highest note without any hassles (like your voice cracking). The exercises make this magical adjustment in your voice by training the muscles that coordinate your vocal chords. You see, to sing through your vocal bridges, your vocal chords need to make very specific adjustments. If they don’t coordinate correctly, you get the unpleasant vocal problem of your voice making cracking noises. You can get the best exercises for eliminating this cracking in your voice by clicking here. These exercises are very powerful and work strength and coordination into the muscles that control your vocal chords. All you need to do is practice the exercises and notice how it feels when your voice makes these adjustments. When you memorize these sensations you will be able to navigate your voice without “breaking” or “cracking”. Won’t it feel great to smoothly sing up through your range easily? Once you practice these exercises for long enough, you will forget that your voice “cracking” was ever a vocal problem at all! Correct muscle coordination will be printed to your neurological system and singing becomes easy. To learn how to erase the vocal problem of your voice cracking, click the blue link below. You can erase your vocal problems with your voice cracking by using these special exercises. Click here to learn more.